Today we take focus on a title that a lot of people didn’t even know existed. This is a game that I found one day while going through the pre-owned section at Gamestop. The game was called Enemy Front. 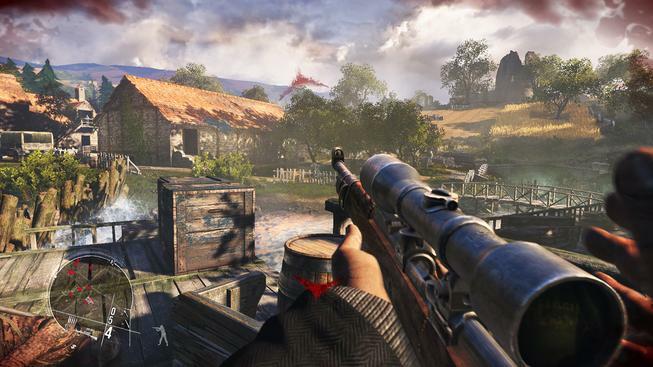 The whole concept of the game was an interesting take on a World War 2 shooter. A war correspondent fighting for freedom, fighting for his life, fighting for a story. The voice of the people was his mission. Swapping from country to country, point in time to point in time. The game proved to be quite the experience. The basic premise of the game is a war correspondent trying to cover the war and having to fight to get that story. The story is told via flashbacks from a set point in time that you later continue from. Robert Hawkins tells you of the events leading up to this final act using several separate points in time over several visits to each, going from one point in time to the next and to the next; only to cycle back around to the first point in time continuing that adventure. Each point in time is set in a different location. This allows for varied maps, weapons, collectibles and mission types. The maps are usually large and free to roam at any point but the enemies have set paths and objectives upon arrival. However, if you raise the alarm these paths will change and vary; but you will still be able to use the map in any way of your choosing to deal with these threats and contain them. Each map holds several mission objectives as well as challenges and varying sets of collectibles. Your path is yours to choose with each presenting its own set of dangers. The environments vary from city to farmland to industrial, from night to day, from sunny to snowy. The Trophies/Achievements provide an extra level of replay value allowing you to find new ways to challenge yourself by taking a new approach with each take as does the same with the difficulty spectrum. The set paths allow even further replay value when trying to master a stealth completion, no death completion or various other challenges you can set upon yourself. However, the game does have some down sides. The graphics are sub-par even for its time. Being a PS3/360 game you can’t expect what you do from current generation of consoles, but the game still came out in 2014 and at times, but not always seemed like a PS2/Xbox game. This wasn’t always a bad thing; this allowed you to play tactically at times but at other times got in your way. Cameras and game play were sometimes also lacking but not unplayable. Simple things that once realized, were able to be worked around and used to your advantage. The game also feature a simple 3 mode Multiplayer. The Multiplayer follows suit of the game itself with many unique and pleasing qualities as well as many that were either standard or unnecessary. Overall the Multiplayer was one of the more complete features but in my opinion still not the main draw. In the end, this game had a great story, memorable characters, solid game play, content variety, and replay value guaranteed make a game worth experiencing its only downside was starting development in 2011 on the verge of the release of PS4/XBO. The current generation of consoles. Released in February of 2014 and November of 2013. The game was already using a near obsolete engine when starting, but having released well after standards were shattered and being only available for what now had become obsolete hardware with a release date of June of 2014 ensure that nobody would bat an eye to its arrival and many of those who did would not give it much of a chance. Homefront: Revolution can relate with Enemy Front also being a solid game build but failed to succeed due to the obsolete engine they shared. It also didn’t help that the game had several delays, several additions and cuts to the game that varied from small to very large including an entire section of the campaign, all the way to Executives abandoning the project all together. To be fair this game did pretty well under the circumstances. I give the game a 6.5 : 10 on the VGS Scale. Go buy/rent the game if you’re a gamer looking for an experience you never knew you wanted. World War II themed setting. Single Player / Multi Player. Developed and Published by, CI Games using the CryEngine 3. Distributed on Windows, Playstation 3 and Xbox 360 by Bandai Namco Games. Written & Edited by, Jack Flowers. NextCinema Spotlight: “X” marks the spot.